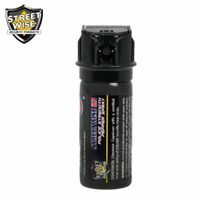 Streetwise Pepper Spray is an excellent choice for your self defense. 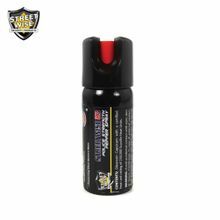 Streetwise has been in the self defense game for many years and has developed an excellent pepper spray. The potency of this spray enables it to bring down even the most aggressive assailants. This model contains two full ounces but is small enough to be concealed in the palm of your hand or to slip inside your pocket. It can also be carried in a holster (purchased separately). The canister measures 4 inches x 1 inch in diameter and employs a twist lock top. Twist the tab in safe mode to prevent spraying accidentally and twist it open to have the pepper spray ready to deploy. The spray pattern is a large stream that will very quickly engulf your target and render him inactive, blind and gasping for air. Also works on feral dogs and other animals. You will get about 12 bursts from each can of Streetwise pepper spray. Notice: This pepper spray product is unavailable to NY, MA, MI, HI, AK, and WI. and cannot be shipped by air, only ground service is allowed.